Lytham & St.Annes on the Sea Lancashire - Local History - St. Annes on Sea Golfs greatest honour goes to America once again. Bobby Jones winning with fine score of 291. Pathe News, 1926. Lytham St.Annes - Golf's greatest honour goes to America once again. Bobby Jones winning with fine score of 291. Pathe News, 1926. Click here and the film clip will open in a new window. "St. Annes on Sea Golf's greatest honour goes to America once again. Bobby Jones winning with fine score of 291". Produced by Pathe News, 1926. Bobby Jones wins the British Open Golf Championship. Golfer teeing off in front of the clubhouse, several men in deck chairs watch. Crowds of people moving across a golf course. Crowd gathered around one of the holes. High angled long shot of a golfer and his caddy approaching a hole. A man looking at the scoreboard. Various shots of golfers putting. of a golfer accepting a trophy, he shakes hands with several officials while the crowd sitting behind them cheers. Various shots of golfers accepting trophies. 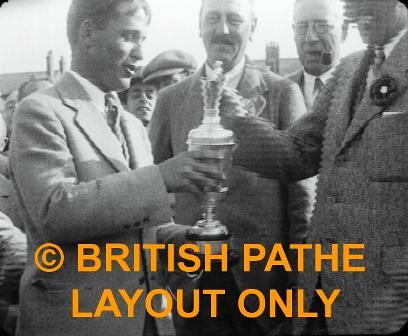 Bobby Jones being presented with a trophy, he chats and laughs with two other men. More shots of golfers teeing off in front of the clubhouse. More shots of crowds walking across the course and watching the golfers. More shots of golfers walking between holes, putting, taking swings etc. More shots of Jones and his fellow golfers at the end of the game.